Hammerhead pulled into Toulon, France after trailing Ivan for over 40 days, after being submerged for 53 days straight, after running out of food with the exception of juice, broth and coffee (running out of coffee is an emergency requiring an immediate emergency surfacing). I was exhausted and slept for hours and hours. The mail bag came down the hatch, containing a "Dear John" letter from my fiancé, and I got in service dress blues and went out on the town with the guys. My memory stopped around the seventh beer and began again the next morning in the vomit soaked mattress of a Vietnamese streetwalker. "Owwww," I said. "Did we do anything?" "Oh, no," she replied. "You much too drunk. You come back tonight, yes?" No way, I thought. "Um, sorry, I have duty. Which way to the naval base?" 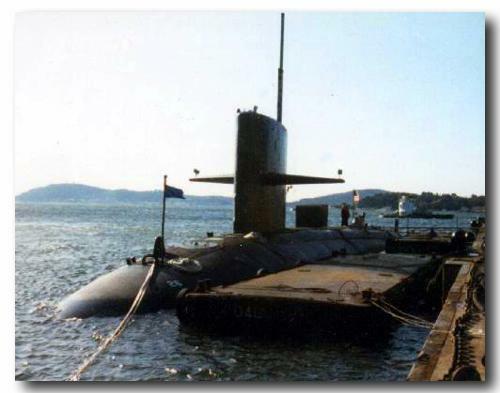 I was thirty feet underwater, below the hull, hanging by a main ballast tank grating. I was angry…we couldn't seem to get the preunderway dive in the water, much less finished. I lugged tanks and gear topside, rolled Spock and Skippy out of the rack and donned my wetsuit. Once Skippy was outfitted we walked down the sloping afterdeck to the number six main ballast tank vent cover. I was holding my breath and going down to unscrew six bolts. Like drowning. We suited up, dove down below the screw and under the boat looking for bombs. This usually is really fun. I just wanted to get out of the water to go on liberty. Skippy ran out of air by the sonar dome. I did the rest of the dive below the camels to the stern. Dangerous with no "buddy." I became concerned at the loudness of a seawater suction, but there was no problem. I emerged from the water by the rudder. Saturday morning. More blinding sunlight and deep blue sky. After a submarine deployment, I relished the sun. I led a sixty man workparty for two hours getting shorepower cables off. Big job, stowing twelve of the thousand foot long cables. When we were all done the men laid below. I was alone on deck. I walked to the bow and muttered farewell to France. I was frantically rotating number two scope on our departure as contact coordinator. "Dive! Dive!" The klaxon roared, Hammerhead slid beneath the water for the transit home. Another tough transit full of drills, frantic admin, and new XO, and torpedo approaches for me and Richard. Soon we'll be home and stand-down will come. An hour ago I qualified submerged officer of the deck, surfaced officer of the deck and duty officer inport. This morning I did a periscope attack on a merchant at five thousand yards. The simulated torpedo was a hit. The captain said, "all things considered, that was pretty good." The transit home - standing OOD watch proved thrilling, exhilarating, frustrating and depressing. My first submerged watch. An hour into it. During a phoned report to the captain. "How is it out there?" "Well, sir, I'm getting used to it." The CO laughed. Bringing the ship to periscope depth was always a thrill: frightening, bothersome, tense and exciting. Sorting out contacts and trying to get up by a certain unforgiving time ("be up for the zero eight hundred broadcast" - the 0800 broadcast is a burst communication lasting mere seconds and it starts at eight o'clock and zero minutes and zero point zero seconds - you'd best have that antenna dry and reaching for the sky at 0759, but tough when 15 contacts are around you at 0745 - where the hell are they?) is all very tense. But once you order, "Dive, make your depth six six feet" it's wonderful. Raise the scope and look through the beautiful blue at the underside of the waves or watch phosphorous fireflies around the optics at night. The rapid rotations looking for close contacts. The disciplined search, projecting your mind out tens of miles from the humble steel hull hidden beneath the waves. The go-ahead from the cap'n to take her deep. Seeing the waves once more triumphantly swallow your view. A farewell to the other world. You sigh as you lower the periscope into the well and order the ship deeper, faster. On with the track. I kept thinking - the most important thing on earth now is to deliver 4700 tons of nuclear submarine to Norfolk by 16 April.